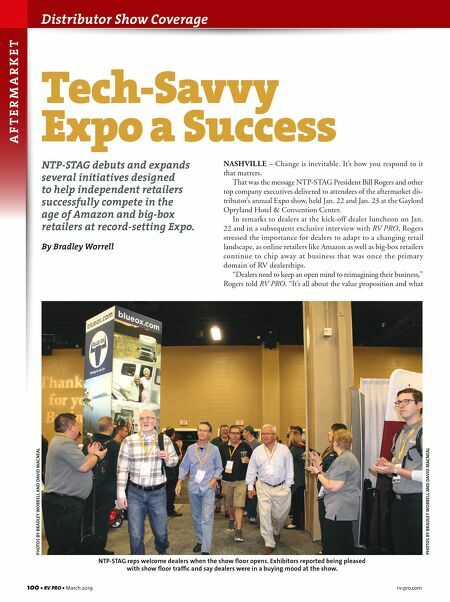 rv-pro.com March 2019 • RV PRO • 101 rv-pro.com March 2019 • RV PRO • 101 dealers can do to make themselves stand out in the market. Especially now, you never want to compete simply on price." So, NTP-STAG set about at this year's show to highlight areas where it believes it can help dealers tap into new product categories, earn greater profits and increase efficiencies. In particular, Rogers noted the distributor has partnered with suppliers including Valterra and Pet Comfort by Weathertech to allow dealers to retail products such as pet care items and housewares and other products not typically associated with dealerships, but which have strong consumer appeal. Rogers noted that research shows about two-thirds of RV owners travel with pets, so it only makes sense to make products available that dealers can retail to their customers. In a related development, NTP-STAG re-envisioned its tra- ditional model store as an "idea center" featuring new product category displays and new merchandising strategies. NTP-STAG General Manager Bill Rogers is pictured next to signage for PARTease, a service from the distributor that gives participating dealers suggested stocking lists of the fastest- moving parts and monthly specials for subscribers. PARTease is just one of several technology initiatives NTP-STAG has developed to help dealers be more efficient and effective. 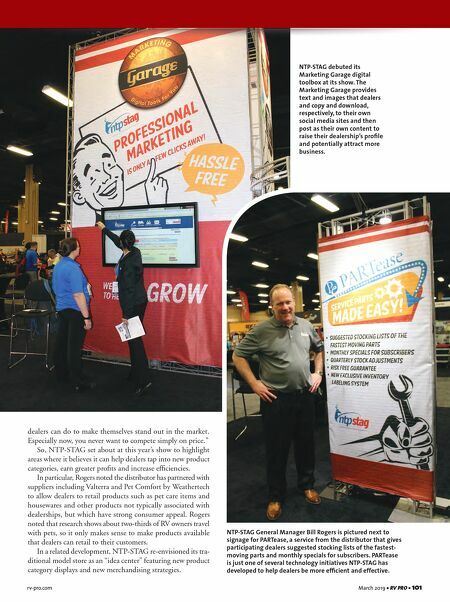 NTP-STAG debuted its Marketing Garage digital toolbox at its show. The Marketing Garage provides text and images that dealers and copy and download, respectively, to their own social media sites and then post as their own content to raise their dealership's profile and potentially attract more business.